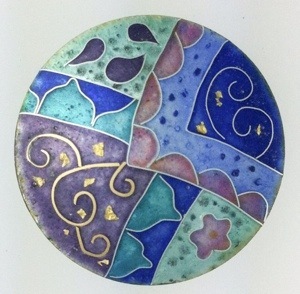 Cloisonné enamel is where fine wires are embedded in the enamel to create the design. 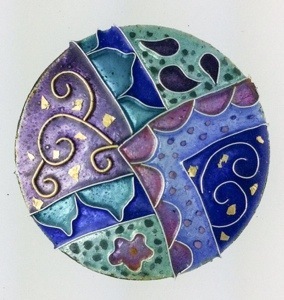 There are a lot of different stages involved in making a piece using this technique and I decided to use my new Nimbus Cloud Dome to take pictures of the making of my new ‘Magic Carpet’ inspired Cloisonné enamel piece. This shows the wires laid onto the base. In this case I am using fine silver foil on a copper base. I have used Soyer Silver flux over the foil and fired that before starting to add the wires. 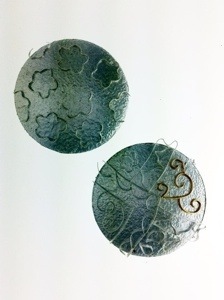 I have used fine silver and fine gold wires. They were fired into place in two separate firings as the design was too complicated to do all in one. I use Kyre-fire to hold the wires in place to go into the kiln. 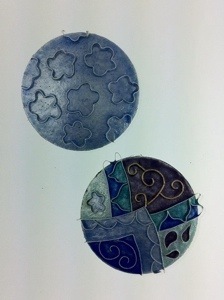 This shows the first layer of colour fired into place. I have used a light blue under where the pink will go. I find that this helps the pink to fire a better colour. 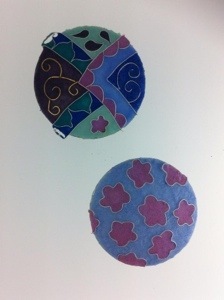 This shows the second layer of colour that has been wet laid into the cells before it is fired. It is quite tricky where the design is complex to keep the colours separate. A good light and the right glasses are essential! Here the second layer has been fired. I am really pleased with the pink particularly. Here I have added fine gold foils and painted oxides to the design. 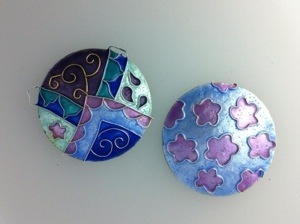 After firing I will then complete the enamelling with two layers of Blythes Medium flux. The two layers will be fired separately. If you apply it too thick it tends to go cloudy and obscure the colours. After the last firing I use a fine diagrit to rub all over the enamel to remove any excess. The aim is to achieve a level surface with no high spots or depressions. The latter show up as a shiny patch amid an otherwise matte surface. If necessary, I add more medium flux and refine and then repeat this stage. When all is flat and perfect I use a succession of wet and dry paper with lots of water to achieve a soft eggshell finish. I use Renaissance Wax to seal the surface and to protect it. This is the finished piece before setting. There are hours of work involved to get to this stage. 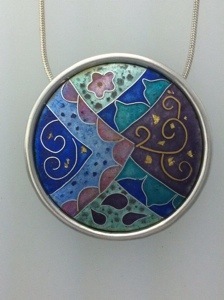 The completed Cloisonné Enamel ‘Magic Carpet’ inspired enamel set in a sterling silver surround.